In 2018, The University of Glasgow’s The Hunterian will mark the tercentenary of the birth of famed Scottish physician, William Hunter, whose bequeath of his library and collection was the foundation for the museum today. The tercentenary year will be celebrated by a new major exhibition based around the objects from Hunter’s collection and the role of Hunter himself, and a publication produced in conjunction with the Yale Centre for British Art. The process of working towards these two landmark productions will be a great undertaking, and it kicked off last week with a research workshop held here in Glasgow at The Hunterian, pooling together scholars, academics and museum professionals from across Europe and America. Working at the event, one of my roles was to assume control of The Hunterian’s Twitter account and conduct the honourable task of acting as the museum’s social media mouthpiece for its three day duration. I have always held strong views on both the importance of social media to museums, and as to the most effective means of exploiting it. So to be given the opportunity to turn these opinions into practice was an exciting prospect. My first concern was with the responsibility of acting as a “voice” for the institution. Social media, as its name suggests, should be inherently social. As such, the social media “face” of an institution should endeavour to have something of a personality. Twitter users for the most part should be conscious the human beings behind the “brand” mask, so to hide that is intrinsically disingenuous. The trick therefore is to find a balance between the personalities of the account users, and the perceived personality an organisation should have. It would not suit The Hunterian to replicate the amusingly acerbic “bantering” of Tesco Mobile for example, nor the unwelcome and slightly intrusive “chumminess” of Tesco Food. The disproportionate successes of two accounts extending from the same company show just how important this issue of “personality” is. The Hunterian, as world-renowned and respected academic and cultural institution can’t be making catty retorts to members of the public or appearing in their “timelines” unprompted to ask them about their lunch. The “voice” of The Hunterian account should be respectable and authoritative, because above all, the public expect it to be so. Having said that, for the account to portray itself as infallible and all-knowing, to me, would seem dishonest and somewhat anti-social. I could have played that role too, as I had every curator in the institution on hand to feed me with any and all relevant information I required. The Hunterian however is not all knowing anyway, it wouldn’t be running research workshops if it was. This is why I made the decision to identify myself personally as the individual behind the account for the duration of the event. The tercentenary research workshop was a unique ocassion, with a social media voice that would be unique to those three days, and that placed The Hunterian in a special position of intense self-reflection. Everyone from the museum directors to the workshop assistants like myself, were engaged in a rigorous study of the history of The Hunterian’s collection and its provenance. There was no single individual with all of the answers; this was a collective group working towards devising a set of learning outcomes, and as constituent part of this, I believed the Twitter account should be representative of that. I may as an individual have more to learn still than the director, but I was no less representative of the institution, on a journey of discovery about itself, than any of the other members of staff. My second concern was with the content that I should share from the event. I am a firm believer in the value of museums engaging their audience through asking open-ended questions and encouraging friendly debate and discussion. However the research workshop did not lend itself particularly suitably to this model, as its purpose was to ask questions that the museum itself did not yet know the answers to, and these were always targeted and highly specific. Musing on areas of study for academic research is not exactly twitter-friendly content. However, the event created a wealth of opportunity for public engagement in other areas. Whilst the workshop itself was a learning experience for The Hunterian, the vast knowledge of its collection provided as context during discussions over the course of the three days created an ideal opportunity to provide an insightful and (crucially) accessible learning experience for the generally casual interest of its audience on Twitter. As such, I endeavoured not to use the account to try and involve the public directly in actual event, but to use the discussions from it to run an almost tandem workshop, if you will, through which the account’s followers could gain a more laid-back, fun and at times quirky understanding of The Hunterian and the man behind its origin. When a workshop group visited a particular area of the collection, I ensured that some photos were taken that could be shared with the public as well. When there was a particular fact or nugget of fun information that I felt people would respond well to, I shared it. With every member of the institution’s expert curatorial team on hand, and a bounty of objects from Hunter’s original collection unearthed from storage, this event was a truly unique opportunity to furnish the public with both a visual and factual experience that is unattainable on a general day to day basis. It was important to me whilst “tweeting” throughout the course of the event, that people were aware of this, and that I did my very best to get the most that I possibly could out of it for them. Finally, I would like to extend my sincerest thanks to my colleagues Sean Kelly, Lauren Henning and Jill Roseberry, and to The Hunterian’s Student Engagement Officer, Ruth Fletcher, who also “tweeted” throughout the workshop, making invaluable contributions to the “#Hunter300” feed, and hopefully, to the experience that The Hunterian’s Twitter following took from it. For anyone who is unaware, there is an exciting initiative in the works in Glasgow, and it’s called the Kelvin Hall Project. 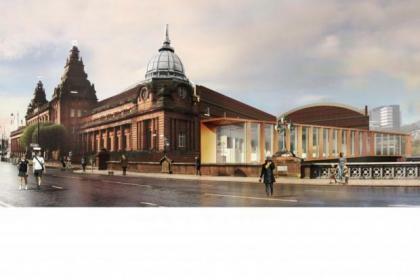 Although still in the planning stage, the outcome of the project will see the city’s iconic Kelvin Hall become a “centre for cultural excellence,” playing home to the University of Glasgow’s The Hunterian, housing its museum and gallery, providing storage for its collection, and allowing for the creation of new onsite learning facilities such as the Centre for Cultural and Heritage Skills and The Hunterian Collections Study and Research Centre. Other partner organisations in the venture are the National Library of Scotland, who will house their Scottish Screen Archive at Kelvin Hall, and Glasgow Life, some of whose Glasgow Museums collections will share storage space with The Hunterian, and will also operate one of their Glasgow Club health and fitness centres there too. This month I was fortunate enough to be part of this planning process, sitting on a focus group panel regarding the overall branding of the Kelvin Hall site. To my mind the most imperative task, and possibly the trickiest for the designers is fostering a public perception of the Kelvin Hall as an entity wholly the sum of its constituent parts. Because this is the project’s intent, it is a “centre for cultural excellence,” not just a venue for various disparate and unconnected organisations, and that includes the gym. The inclusion of a gym next to these other three organisations within this “cultural centre” may seem odd to you though, I know it certainly did to me at first. The rationale is there though. Although many Glaswegians remember the building most fondly as the former home of the Transport Museum, the Kelvin Hall is an exhibition space with a rich and varied cultural past, playing home to everything from concerts, the circus, world championship boxing, Boys Brigade meetings and most recently was home to the Glasgow Rocks basketball team. The Kelvin Hall of the future therefore must respect and reflect this heritage. It has always been more than a museum, and should continue to be so going forward. The greatest logical inclusion for the gym however is that there is already one there. The leisure industry is one of the fastest growing in Britain and the increasing demand for sports facilities of this kind means its removal would prove highly unpopular. The Glasgow Club facilities at Kelvin Hall are closed at the moment and I remember this being met with much grumbling from its patronage at the time. This ongoing swell in gym usage is something the Kelvin Hall is going to need to be careful about however. There are warning signs only a few hundred metres up the road where the University of Glasgow made the difficult decision to bulldoze five, in no way unsuccessful, bars and a nightclub attached to the Glasgow University Union in order to satiate the demand from the student body for more sports facilities. With the surge in housing developments in its locality and the continuing gentrification of the Finnieston area, demand for the Kelvin Hall fitness suite is likely to be high. The Kelvin Hall must ensure that this demand is not so great that it translates into demand for more space, as has happened at the University. These potentially frustrated gym-goers may feel they are entirely justified in making such a demand given that their council tax money will be funding much of the Kelvin Hall, as well the resplendent peacock that is the Kelvingrove Museum and Art Gallery already looming from directly across the road. Therefore, it is imperative to my mind that the Kelvin Hall be viewed by the public as a homogenous entity, the sum of as opposed to a random assortment of its constituent parts. The Kelvin Hall must sell itself as a single wide-ranging cultural experience, where visitors can pick and choose their activities and navigate seamlessly between them, rather than a jumbled series of individual introspective attractions, a hall of mirrors, if you will. The absence of a swimming pool makes this even trickier. A pool, like a museum, can be a family activity. What better time in fact for parents to take their children around a museum than post-swim, filled with endorphins and oxygen pumping to their brain? The theme of this years Museum’s Association conference was “Museums Change Lives,” and the Kelvin Hall being both a museum and a fitness centre certainly adheres to the “wellbeing” element that was discussed in Cardiff this year. The project will also appease naysayers of the idea of museums as communal centres for social change, such as the late Stephen E. Weil who warned against institutions presenting themselves as second-rate alternatives to better suited organisations. The Kelvin Hall would not be a museum attempting to host fitness classes, it would be a museum and a gym at the same time. A strong brand message for the Kelvin Hall is absolutely key to this. Coming back to the Museum’s Association Conference this year in Cardiff, I was fortunate enough to attend a workshop run by Michael Smith of Cog Design. In it, he discussed the thinking and concept behind his company’s much lauded (and deservedly so) rebrand of the The Beaney House of Art and Knowledge in Canterbury, formerly the Beaney Art Museum and Library, and much of it resonates with me now as I think about the Kelvin Hall. Of particular note is the bold decision to rename the museum. Smith’s reasoning for this was that the Beaney is a unique institution and this needed to be prominently highlighted. By describing the museum as a “House of Art and Knowledge,” visitors would be instantly made aware that a visit to the Beaney offers a different experience to the plenitude of other museums and galleries in the area. The Kelvin Hall is certainly a venue that will boast a similar uniqueness and might do itself a favour to highlight this. As I noted earlier, there is already a vast museum and art gallery literally across the road from it and one might forgive someone for mistaking the Kelvin Hall and Kelvingrove for, at a glance, being two vaguely similar buildings, with less vaguely similar contents, and very similar names. Smith also discussed how fortunate Cog Design had been in the all-encompassing nature of their design brief at the Beaney. Far beyond simply creating a logo and selecting a colour palate, the company were allowed to design everything from the internal floor plans and way-finding signage to the little male and female signs on the toilet doors. By having a design consistency running through every aspect of the museum, the branding of the Beaney has become less about having a recognisable badge above the front door, and has bestowed upon it a distinct and familiar personality. The Kelvin Hall again, with its seemingly disparate collection of attractions is a venue that would benefit from a similar initiative. Lastly, the reasoning behind the new logo design for the Beaney was particularly interesting. As you can see in the picture below, the emblem is a large capital “B” with both of its counters removed. It is simple, yet incredibly practical. Free from any internal design elements, the blank space within the “B” can then be filled with a variety of different patterns or images. Smith described the logo as being able to act therefore as, “a window” into the Beaney, revealing any and all objects and activities that it has to offer (as can be seen in the image). The Kelvin Hall could undoubtedly benefit from a similarly creative implementation. Without suggesting they copy Cog Design’s idea, but to use it as an example, a similar “window” logo featuring the different elements contained within the venue would both raise awareness of what the venue has on offer, while highlighting the fact they are offered as part of a single “centre for cultural excellence” at the same time. Clearly this rebrand is far from straightforward, but Cog Design’s work at the Beaney proves that even Kelvin Hall’s unique requirements can be addressed given the right amount of creative thought. Given what I have seen so far, it strikes me that these thoughts currently are focussed too heavily on creating a brand that reflects a “centre for cultural excellence,” when really the necessity should be to shed light simply on what such a centre actually is. Were the Kelvin Hall simply to be the building that houses its contents then maybe the former would suffice, but the idea is for it to be perceived as this homogenous entity, comprised of a variety of cultural organisations. Given the distinct variety of these organisations, the Kelvin Hall will be a confusing concept for some people, so the branding imperatively must be uncomplicated, and if possible, explanatory. The project is a great idea, and that idea must not get lost in a Kelvin Hall of mirrors. I wasn’t sure why, but it was an odd surprise to me to be confronted with the word “Wunderkammer” (Cabinet of Curiosity), half way through a visit to the Museo Correr in the corner of Venice’s Piazza San Marco. Perhaps it was just the brief respite of encountering a foreign word I understood in the middle of a week of bungled attempts at Italian pleasantries, or maybe just that I’d always viewed it to some extent as an insider term used mostly by museum people. Further to that, as a believer in strong supporting interpretation and deeper, more worthwhile engagement with individual exhibits, it’s not a method of exhibiting that I’m a fan of, nor thankfully, particularly used to. Yet there it was, the Correr Wunderkammer. Once I’d begun to think about it however, the concept was not so surprising at all. The earliest pictorial documentations of these cabinets of curiosity all stem from the renaissance Italian city-states, and that of Venice’s own Teodoro Correr, albeit more recent, was one of them. Therefore, a museum of “Venetian Art and Life,” born out of a traditional Wunderkammer collection, such as Museo Correr is, has every right, an obligation even, to ensure the concept is at least addressed in its programming in some fashion. The Wunderkammer concept is of practical application to the museum as well however. Venice, as I experienced, is a city fraught with challenges to any and all forms of exhibition. The first of these is space, or the significant lack thereof. It is a very small city with a high demand for heritage tourism, and, as a World Heritage Site, can make very few alterations to the venues selected to house such institutions. Museo Correr is located within the Procuratorie Nuove, built to contain the residencies and offices of senior figures within the Venetian republic. This is a large enough venue, however it is divided into mostly quite modest sized rooms, meaning there is limited space to exhibit within as visitors expect thematic progression as they pass through doorways. Venice is also a city with an abundance of art, and even more history for the museum to cover, so by exercising their right to exploit the Wunderkammer theme, Museo Correr has found a historically relevant solution to their physical space limitations. Venice is also a city that is far from short of things to see, so to attract and hold the attention of the visitor is no mean feat. The Procuratorie Nuove is a fascinating treasure in and of itself, so at all times the objects in the museum are in competition with the very rooms that house them. You can’t even glance out of a window most of the time without having your breath taken away. By grouping and concentrating the museum’s impressive collection into cabinets of curiosity, the Museo Correr fights awe with awe, wonder with wunder, ensuring their displays remain object focussed within an environment ever-conspiring to steal their limelight. Having said that, something about it did not quite work for me. It probably revealed itself too late into my visit. I had already explored the entirety of the temporary gallery Palladio and Russia, in which there was no translated interpretation, and again in reverse as there was no exit from the fully linear exhibition other than the way one came in. The permanent galleries then begin with a journey through fourteen grand rooms, all restored to their historical functions and furnishings. Initial navigation through the Museo Correr feels more akin to a stately home visit than a museum experience. Then, all of a sudden, the audience goes from seeing a limited and careful display of objects to having to look at all of them at once. Fatigued somewhat by the seemingly never-ending exhibition that is the city itself, and a long and heavily annotated journey through an admittedly beautiful series of bed and dining rooms, a Wunderkammer was not a welcome surprise. The biggest problem however was that the Wunderkammer did exactly what they were supposed to; it filled me completely and absolutely with awe. It fuelled me with a hunger for information that could not be satiated as no object could be afforded the space for any meaningful interpretation. Or perhaps the reason was that my experience was sullied by a gripe with the Museo Correr’s rationale behind the entire concept of the gallery before I had even entered it. On the outside, a large information panel explains to the visitor what a Wunderkammer is and why they have seen fit to create one in their museum. The definitive positive however appeared to be that it allowed their staff an intense and ongoing experience of delving deep into their storerooms, reorganising the collection and improving its preservation, all punctuated by a series of “sensational discoveries.” Or, in layman’s terms, “we killed two birds with one stone and had a great time while we were at it.” As someone at the beginning of a professional museum career I appreciate the importance of this, however that day I was a visitor, and I felt a little left out. Obviously the museum can’t allow the visitors to run around the storerooms making sensational discoveries for themselves (although the Museum aan de Stroom in Antwerp actually does). However, where not every museum can allow visitor access to its physical storage, access to its virtual storage should be limitless, and if an institution doesn’t have a public digital collection, it should. I’d like to return now to a theory posited in my previous post, relating to the recreation of the British Museum on Minecraft, revealed by the institution at its second Museum of the Future debate. My preference for the initiative rather than a straight brick for brick, object for object replication, as planned, would be for the exhibited contents of the Minecraft British Museum to be co-curated and debated about by its online community, thus deepening their engagement with the building and its collection. As I stood grumbling at the, “a great time was had by all” information panel at the Correr Wunderkammer I realised that the use of Minecraft for such an initiative would hold back what could be an great public engagement activity. Minecraft as a game requires a good deal of time and patience to acquire the skills that would be required to recreate objects within the British Museum’s collection, the activity I would like to see needs to be simple and instantly accessible. Further, although rebuilding the objects piece by piece would foster a studious engagement with the physical intricacies of each antiquity, it is again time consuming and not entirely necessary. What I would like to see, in every museum, is a digital program that provides its online community with a virtual exhibition space to curate. To use the British Museum as an example again, why not give people a virtual rendering of the round reading room? The first Museum of the Future debate was strongly in favour of the appropriation of this currently vacant space as an exhibition area. The circular shape of the space would prevent users from arranging everything along the walls too, and help breed some creativity. Digital visitors could then use the museums online collection to delve into, explore, make “sensational discoveries” for themselves and discuss, as a community, how they would like to populate and arrange their very own virtual Wunderkammer. Users should not need to “mine” for the necessary minerals and then laboriously reconstruct the object. That time should be spent exploring the digital records of a museum’s oft-hidden collections, reading and learning about what appeals to them, following which, they will have the option to add that object to the virtual exhibition. Whilst a digital collection makes museum collections more accessible, an activity of this sort, increases and further incentivises engagement with it. Given the chance to be an online “curator,” visitors will interact with the virtual stores in the same way a museum professional would, creating a far more rewarding and educational experience for them, the fruits of which will be similarly intriguing and insightful for the institution itself. In the end, this is just one suggestion. Any engagement activity that encourages and facilitates greater exploration and interaction with digital collections would be welcome. It’s not enough to just have an online database, these virtual stores have to be easily and enjoyably navigable, as Museum aan de Stroom’s physical one is. Digital is opening doors for museums. Without any spatial constraints, the Internet is a Wunderkammer without the clutter. A museum can now give the visitor the opportunity to see everything in its collection, without ever overwhelming them, and all of these objects can be fully annotated and interpreted. Perhaps best of all, the possibilities of digital allow these objects to be interacted with, even the most fragile, in ways that the physical world cannot allow. An interactive digital collection can in effect, be a cabinet of curiosity without the glass.